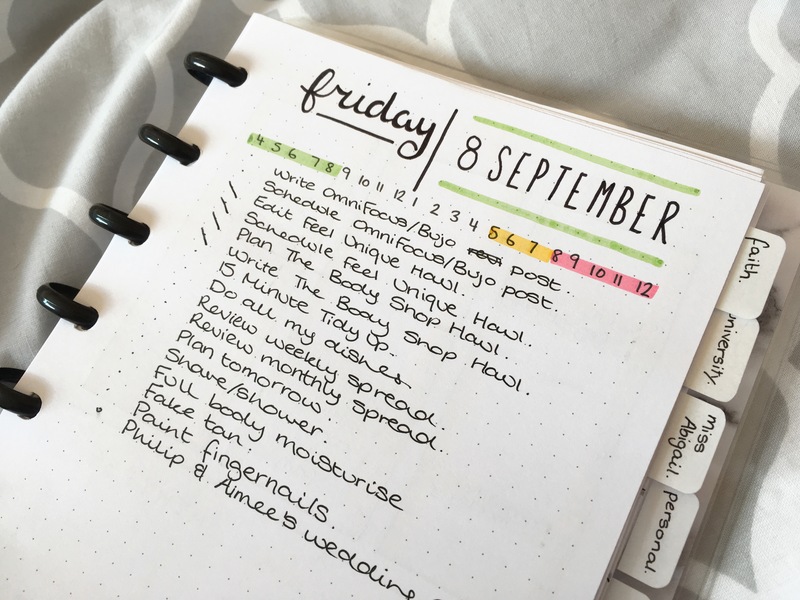 Today I’m back with a very exciting, and hopefully very comprehensive post all about how I use my bullet journal and the wonderful OmniFocus app to get things done. I’ve been using this system for around 2 months now and it’s absolutely amazing! With this system, I have an entire month of posts planned in advance and I’m usually 2/3 weeks ahead of myself with the wonderful WordPress scheduling function. Not to mention that I can keep track of other projects I’m working on for Etsy or uni and know exactly what needs to be done to get it completed on time. Essentially today I’m just going to talk you through how I input tasks into OmniFocus, how I categorise them and how I then translate them into my Bullet Journal. We have a lot to get through, so let’s get started. At the beginning of every month, my planning starts in my Google Calendar. I plan one month in advance (meaning on September 1st I plan all my October posts). On the left-hand side of the screen you’ll notice I created separate calendars for all the different areas of my life that I might need to plan. When I’m doing my blog planning, I like to hide all my other calendars so I can see my editorial spread without getting confused. I personally try to post 3 times a week (Monday, Thursday and Saturday) and have a new Etsy release every Wednesday, so these are the things I schedule in at this point. Note: You’ll notice some of the items are greyed out. Once I have scheduled a post or added a listing, I grey it out so that I know which posts are completed and which ones need work, at a glance. 2. Input tasks into OmniFocus inbox. Now it’s time to turn these ideas into actionable steps. The first thing I do is turn back on all my calendars in Google Calendar (I want to be able to see all the events and projects I have coming up, not just stuff for the blog). Then, I open up OmniFocus on my phone and add all these items to my Inbox. At this point, the only information I worry about adding is the Item Title and the Date Due. 3. Create some key folders. Now that all your ideas are inputted, you’re going to want to make a few folders to divide up your projects for easy review and management. Personally, I use Etsy, Blog, University, Personal, and Church – but they can be whatever you need them to be. You can also further categorise inside these folders. For example, my Etsy folder has sub-categories for my Disney Collections, Film Quote Spreads, Layout Stickers etc. 4. Turn your tasks into projects. So, you have all your ideas inputted and all your categories made, now it’s time to turn all those Inbox ideas into actionable projects. Select the first task in your inbox, scroll to the bottom and tap ‘convert to project’, this allows you to create a step by step plan detailing everything you have to do before you can complete the task. Then select the folder you want to put it in. Now, you have a few options. You’ll be asked whether you want to stay in your inbox, or go to the project. Personally, I’d recommend doing it as you go, so I always click Go To Project, that way a project doesn’t accidentally get overlooked. This is by far the most tedious part of the whole process, but it’s also the reason it works so well. The first thing you’ll want to decide is the type of project. By clicking on the title of the project you’ll see the option for ‘type’ with the choices of ‘sequential’, ‘parallel’ and ‘single action’. Personally, I never use single action, but the other two are really useful. For all things blog, sequential is my favourite… I can’t write a post before I’ve planned it, or schedule it until I’ve edited it, so this keeps me realistic, and parallel is great for general housework or uni stuff. Once you’ve selected your type, go back and insert some tasks. Personally, I have a page on my OneNote where I lay out all the basic steps I usually need to complete a certain type of task (e.g. for a blog post I need to plan, write, take pictures, edit and schedule). This way, I don’t overlook anything too important or time-consuming. The most important thing to think about is your Due Date, not only for the project as a whole but also for each individual task. Personally, my dates are never 100% accurate, but I try to get them scheduled far enough in the future that all my posts/listings are ready to go up at least a week before the date in my calendar. That way, I leave myself room for error. Once I’ve listed all the tasks (with due dates) for one project I go back into my inbox and repeat steps 4 and 5 with the next project (I’m sure you can imagine how tedious this gets when you’re doing a whole month of planning in one session). Like I mentioned in step 5, my due dates are never very accurate. I often look at my forecast and see that I have 20 tasks scheduled on Monday and 1 on Tuesday. My way of fixing this is by shuffling my forecast around to redistribute things a little more evenly. Since I do this only a couple of days in advance it also allows me to take into account my appointments and work rota, meaning I have a better idea of how much I can realistically get done on a given day (for example, I never schedule photography on days that I’m working as it’s too dark before and after work to get good, clear shots). I never really have recurring tasks for the blog (although I suppose I could for things like Plan With Mes and Wrap Ups… I should do that) but they’re really useful for household tasks. For example, I have laundry scheduled once a week – as soon as I complete the task, it’s automatically rescheduled in 7 days’ time. It’s a great way of staying on top of things (and it prevents me from accidentally going 2 months without lifting the hoover). 8. Into the Bullet Journal. One of the tasks that I repeat every single day is ‘Plan Tomorrow’. This is where I sit down and (you guessed it) plan tomorrow! When I create my dailies, I always start with timed tasks (e.g. work, lectures, meetings etc) and then add my to do list in below that. Since we did so much prep in OmniFocus, this takes no time at all and allows me to just tap forecast, tap tomorrow and write it all down. Then, as I get on with my day, I can look at my bullet journal and tick everything off. I only really go back into OmniFocus at the end of the day to reschedule incomplete tasks and plan the next day. And that’s it in a nutshell. OmniFocus has so many other functions that I haven’t really dabbled in yet (like being able to set a specific context for your tasks, or estimated duration) but it’s working really well the way it is so I’m not going to rock the boat! I really hope you guys enjoyed this post and found it useful, I’d love to hear how you guys plan (especially for your blog) I’m always looking for new tips and tricks. Thanks! This was great to read – now to implement…! Ha ha, thanks… and good luck! There are so many of these posts going around at the minute and I’m finding them all so helpful, thank you! Thanks Chloe, I love reading organisation posts too! I am so in love with you post! You know I have this thing looking at a well organize planner on calendar makes me want to scream! not in a bad way, just overly excited!